My daily readings points me to another framework that may be applicable for us to view the situation. 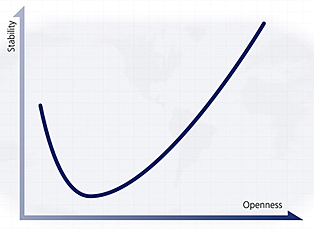 The x-axis of the political J-Curve graph measures the 'openness' (of freedom) of the State in question and the y-axis measures the stability of that same state. It suggests that those states that are 'closed'/undemocratic/unfree (such as the Communist dictatorships of China and Cuba) are very stable; however, as one progresses right, along the x-axis, it is evident that stability (for relatively short period of time in the lengthy life of nations) decreases, creating a dip in the graph, until beginning to pick up again as the 'openness' of a state increases; at the other end of the graph to closed states are the open states of the West, such as the United States of America or the United Kingdom. Thus, a J-shaped curve is formed. States can travel both forward (right) and backwards (left) along this J-curve, and so stability and openness are never secure. 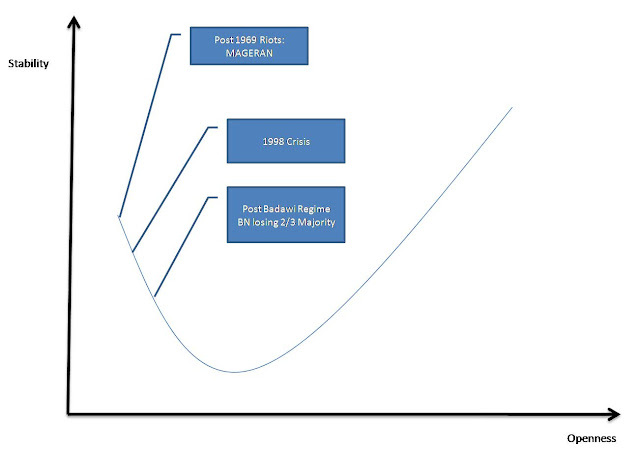 The J is steeper on the left hand side, as it is easier for a leader in a failed state to create stability by closing the country than to build a civil society and establish accountable institutions; the curve is higher on the far right than left because states that prevail in opening their societies (Eastern Europe, for example) ultimately become more stable than authoritarian regimes. 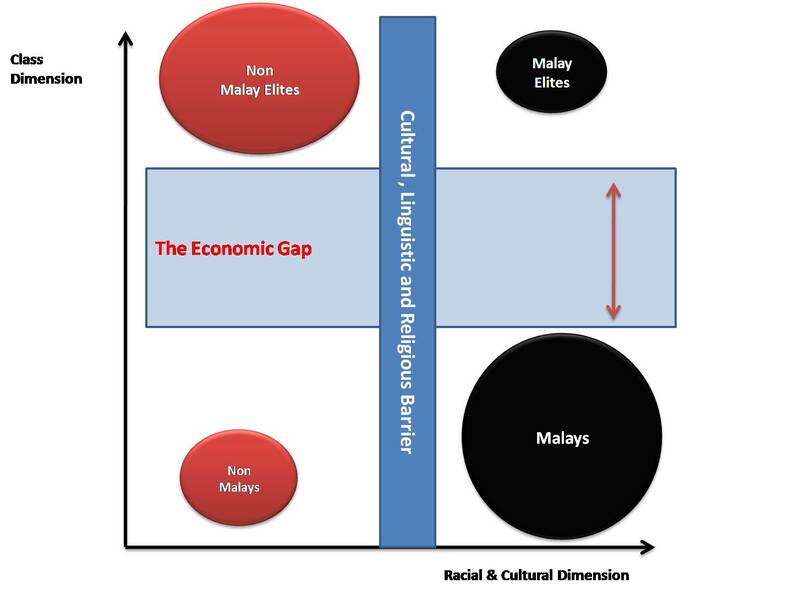 So how can we use his framework for Malaysia. Where are we exactly on the Curve? 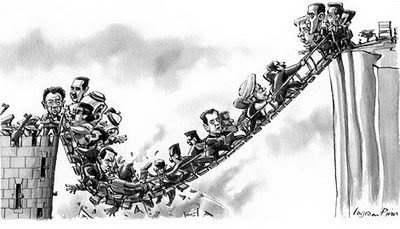 My initial question on plotting Malaysia is how stable are we and how open are we? I could only relate to my own experiences and basic reading of historical events in Modern Malaysia... of which 3 major trigger events were notable as a measure. The positioning is pretty clear from the openness perspective of the 3 Major events, we saw clap-down and military rule in 1969 and near similar reaction in 1998 but we have seen nothing post 2008 events. On that note what can we observe of late? Ask yourself do you think that the country is more "stable"? What would be the tipping point? 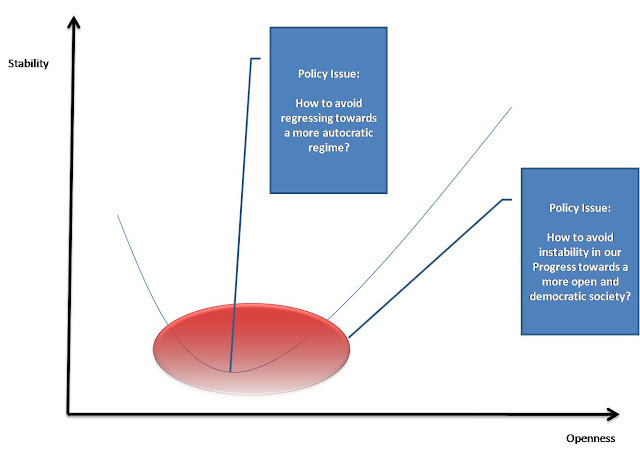 In this framework I said that there is a major Cultural, Linguistic and Religious Barrier that will block the Unity within the Class Dimension and as long as the Government has the Economic capacity to ensure that the Economic Gaps are managed we should be OK.
And the Government was swift to act to restore "stability" with Military rule..
How do we ride the J? Champion the Democracy that you are fighting for...avoid the Red Area in the above graph. Building a progressive society which shall be oriented to modern science and technology. Loyalty to King and Country. Mutual respect and good social behavior. When was the last time you were in church on Sunday? How many of you say your prayers before your meal? Or you just wallop the whole thing in without even thinking about GOD..
Count yourself....and your associations and compare that with the people around you say in your office, family etc etc.......whats the %? And to people as well as businesses what is your level of integrity in doing business? We've heard so many large scale corporate failures in recent years arising from complete failure in your principles of integrity......ever heard of terms like corporate governance and risk management..these are tools designed to control them.......the recent one freak me out..